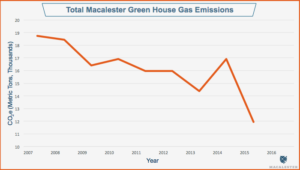 Macalester College President Rosenberg signed the American College and University Presidents’ Climate Commitment. In 2009, the college Sustainability Plan adopted a carbon neutrality date of 2025 and includes the requirements of a climate action plan. 2025: 52 percent reduction from 2006-2007 levels, 48 percent would be offset obtained from off-site renewable energy. First, the college will invest in energy efficiency. To learn more, check out the Energy Projects Page.